Welcome to the JVNP 2.0 Update featuring a primary JV request courtesy of fellow JVNP 2.0 Partners Jake & Brian Fouts (The Elevation Group – Elevation Insiders financial, business, and entrepreneurial training evergreen affiliate program JV invite), Buzz Builders (Minesh Bhindi – Gold And Silver For Life – Christmas Competition pre-launch), and More … in Today’s give the gift that keeps on giving – the knowledge that can provide true financial prosperity edition. 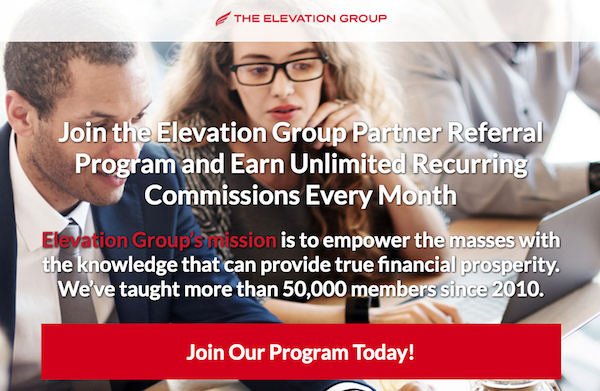 Join the Elevation Group Partner Referral Program and Earn Unlimited Recurring Commissions Every Month. Fellow JVNP 2.0 Partner, Elevation Group’s mission is to empower the masses with the knowledge that can provide true financial prosperity. We’ve taught more than 50,000 members since 2010. Our experts discuss an array of financial, business, and entrepreneurial topics including precious metals, alternative stock investing, real estate, paper assets, and business growth, among others. When you sign up for The Elevation Group Partner Referral Program we’ll give you a special link to our current offers that you can share through an email, an ad, Facebook post, on your blog, a tweet — however you choose. You’ll earn income for every person who buys any of our offers through your affiliate link. Elevation Insiders is a monthly subscription program priced at $47. For every sale made through your link, you’ll get a generous 50% commission. New customers are also offered to upgrade to an Annual Elevation Insiders Membership. The Annual Membership is offered for $297 and provides 50% commission as well. You’ll get a recurring 50% commission every month for as long as the person you referred maintain their membership. For the $1 trial offer, the same rules apply. You will get 50% commission for every successful referral that converts to monthly and you will keep receiving 50% monthly commission for as long as your referred subscribers stay on board. If they stay for a lifetime, you get lifetime commissions, too! >>> Visit the EG Affiliate Details & Registration Page. Why Become an Elevation Group Partner? Get a generous 50% commission on every referral you make. For trial offers, you will get 50% commission on any of our other products the client purchases within the first 90 days. If the client chooses a product that has a subscription, that commission will be for the life of the subscription. Our current offers all involve monthly or annual subscription fees. That means ongoing commissions for you! We recognize your role in helping us scale fast and educate more people — so we return the favor. Payments come in every month like clockwork! You’ll get reliable marketing support like swipe emails, free content you can use on your promotions, as well as tips on how to promote effectively. Let Us Achieve Prosperity Together. Feel free to reach out to us directly…and we’ll do our best to support you. What do Jeff Walker & Ryan Levesque have in common? They Both Support BYE! Best Year Ever helps the person who feels like they haven’t quite reached their full potential effectively set and achieve meaningful goals and accomplish what matters most. Product pricing: Independent Study – $197, VIP Package – $397, Live Event Package – $997. Affiliates earn 40% commission per sale. Experienced affiliates, only, please. Subject to approval. Either reply to this newsletter with proof of past performance or visit => Michael Hyatt – 5 Days to Your Best Year Ever 2017 Launch Affiliate Request Form. Average Net Raw EPC: $7.03! Average Opt In Rate: 57%! Approx. $1400 CPA! Proven Profitable Across 3 Niches … Personal Development – Financial/Investment – Internet Marketing. Average Net Raw EPC: $7.03. Average Opt In Rate: 57%. Approx. $1400 CPA. Leads Contest: December 18th – January 9th. Sales Contest: January 9th – February 13th. Christmas Competition JV Contest Details => Minesh Bhindi – Gold And Silver For Life – Christmas Competition JV page. Due to unsavory characters infiltrating Sonia’s affiliate program via the usual affiliate registration process, we’re going the invite only route until further notice. If you have the proven ability to convert and retain multiple sales of a product as an affiliate, and know how to follow simple rules (like NO cookie stuffing, “scam” reviews, etc. ), feel free to reply to this newsletter, or contact Mike Merz Sr => im4newbiesATgmailDOTcom, with proof of past performance for consideration. This is the Last Time you’ll be able to Partner with Anik on this … EVER. Don’t Miss Out! Anik Singal is launching Inbox Blueprint for the last time EVER! Last launch converted at over $5 EPC, and tweaking has leads to a 73% increase in conversions! PLUS, he’s giving away up to $4 per lead! (For just an email!) Don’t Miss This! Anik Singal – Inbox Blueprint 2018 – The Final Launch JV page. Ring in the New Year in High Ticket Commission Fashion & Get on Board what may wind up being the Biggest Launch of 2018! 7 Figure Cycle’ is a complete training program that allows people to copy our VERY unique eCommerce selling system. We are fully expecting this launch to be life-changing for all involved with a $200K Prize Pool, $2/Lead in Pre-launch Prizes and $1248 Commissions Per Sale! Aidan Booth, Steve Clayton, Chris Keef + Todd Snively – 7 Figure Cycle JV page. Ca-ching in the New Year promoting Mindvalley’s Most Successful Program! Team up with Mindvalley and step into the New Year with the launch of our most successful, best-selling, and famous program – Christie Marie Sheldon’s Unlimited Abundance. UA is one of our highest converting offers, and its revenue consistently hits over $1Million. Looking back on the last UA launch, ave. EPC for affiliates was around the $1.20- $2.64 mark. Mindvalley Affiliate Registration => Vishen Lakhiani + Christie Marie – Mindvalley – Unlimited Abundance 2018 affiliate regsitration. Imran S, Travis Stephenson and other fellow JVNotifyPro 2.0 partners are waiting in the wings … keep your eyes on your Inbox, and follow the action in the JVNP 2.0 Premium VIP JV Announcement archives.